How much do you know about becoming a great guitar player? There are many myths about playing and practicing guitar that slow down your progress. 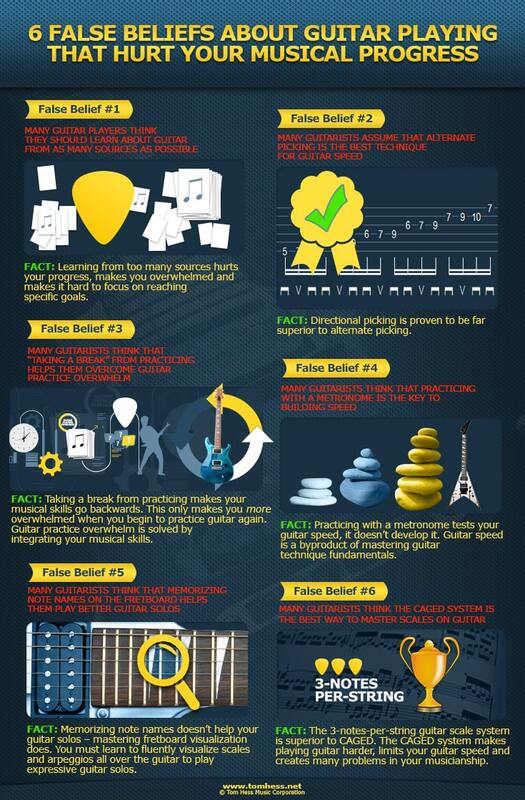 To learn what myths that can hurt your guitar playing, take the test below to see if you are on track to reach your musical goals. Question #1: What improves your guitar speed the most? Practicing to a metronome every day, starting at a slow tempo and gradually getting faster. Using the right guitar speed exercises that make you play faster. Practicing with a metronome tests your guitar speed…it does NOT develop it. Guitar speed is a byproduct of mastering guitar technique fundamentals. Practicing over and over with sloppy technique ingrains bad habits into your muscle memory and makes fast playing impossible. Want a step-by-step guide to doubling your guitar speed? Download this guitar speed guide to learn how to play guitar faster than you ever have before. Question #2: Which approach helps you reach your musical goals most quickly? Learning from as many sources as possible to become a well-rounded guitar player. Being self-taught, so you can develop your own original style as a guitar player. Learning from one proven source, to take the shortest path towards your musical goals. You learn things out of order. The order in which you learn new things is very important. Learning the right things in the wrong order makes it hard for you to apply and use what you are learning. You become overwhelmed from being exposed to too much information. This feeling of overwhelm makes you less motivated to practice. It becomes easier to learn the next new thing than to actually practice and become a better guitar player. Randomized learning makes it hard to focus on specific goals. It also makes it hard to track your progress. You never really know how good you are and what to do next to get where you want to go. These problems slow down your progress and make you frustrated. Being self-taught hurts your progress in similar ways as learning from lots of different sources. Self-taught guitar players usually don't know what to focus on, when to focus on it, why to practice one thing over another and how to train themselves to reach their goals. You become a great guitar player fast when you focus like a laser on learning from a single proven source. This keeps you on a straight path towards your musical goals. Question #3: What is the best picking technique for playing scales on guitar? There is no best technique, they all work equally well. Many guitarists think that all picking techniques are equally useful. This is false. Some picking techniques are objectively better than others. The best technique for playing scales on guitar is: directional picking. Question #4: What should you do when you feel overwhelmed from having too much to practice on guitar? Taking extended breaks from practicing guitar doesn't help you progress. It only wastes time that could be invested into becoming a better guitar player. You can improve your musical skills without ever taking extended breaks from practicing. You also don’t need a huge amount of discipline to consistently practice guitar. You need to balance learning new things and integrating them with skills you already mastered. This allows you to keep practicing guitar, make regular progress and avoid overwhelm. Question #5: What is the fastest way to master fretboard visualization for guitar solos? Fretboard visualization is the ability to play and improvise in any area of the guitar neck. Memorizing note names on guitar does not improve your fretboard visualization. Note names don’t help you visualize scale patterns and stay in key during a guitar solo. Mastering a single scale all over the guitar helps your fretboard visualization the most. When you see the guitar neck as ONE interconnected scale shape, improvising guitar solos becomes easy. Question #6: What is the best system for learning how scales work on guitar? There is no best system. The more systems you know, the better. Mastering scales the right way help you create awesome guitar solos, write cool songs and become an expressive musician. The 3-note-per-string scale system is such a system. The CAGED system is confusing, incomplete and inconsistent. It makes playing guitar harder, limits your guitar speed and creates many problems in your musicianship. You now know the most common guitar playing myths that slow down your progress. The next step to becoming a better guitarist is to master your guitar technique, so you can play guitar as fast and as clean as you want. Download this free guitar speed eGuide & learn how to impress yourself and your friends with your awesome guitar playing. Become an awesome guitarist quickly with proven online lessons for rock guitar.